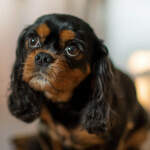 Cavalier King Charles Spaniels are an intelligent small dog breed. They are among the largest dog breeds in the American Kennel Club's Toy Group. These beautiful companion dogs are always in a cheerful mood and are known for constantly wagging their tail (even when moving). The breed is intelligent, agile, and has flushing and retrieving instincts inherited from it's spaniel ancestors. 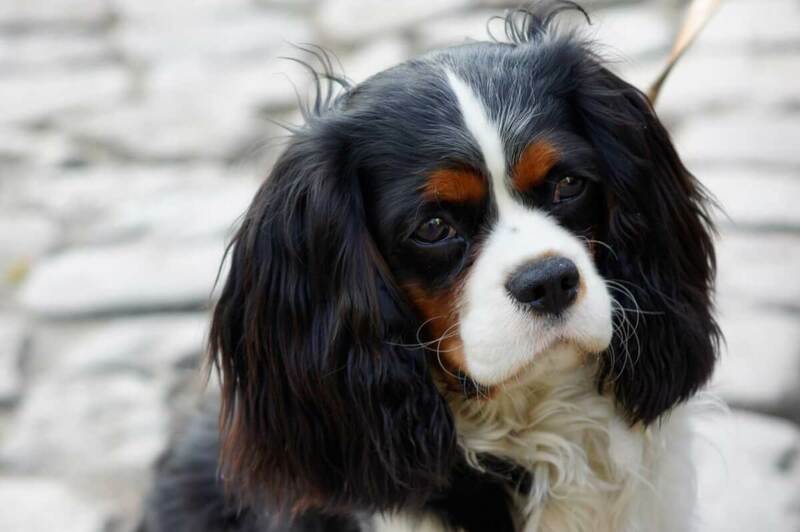 The Cavalier King Charles Spaniel's dark eyes are often thickly traced by darker fur which makes the eyes look larger (similar to puppy eyes), generally resulting in a constant supply of petting and treats from its owners and strangers. Not a good choice for households with birds, hamsters, guinea pigs etc. Although the Cavalier King Charles Spaniel dog breed has been around for centuries, the breed today is a recreation of the original Cavalier King Charles Spaniel whose bloodline was lost due to crossing the breed with other small dogs such as the pug. The Cavalier is a small dog breed with a silky medium length coat which is feathered on the chest, ears, feet, legs, and tail. Their coat requires medium maintenance including brushing twice weekly and bathing as necessary. Cavalier King Charles Spaniels are very fond of their owners and will follow them wherever they go. Due to this dependent personality they can develop separation anxiety if left alone for long periods so this should be taken into consideration with individuals who are away for long durations. The Cavaliers are good with children and other dogs. 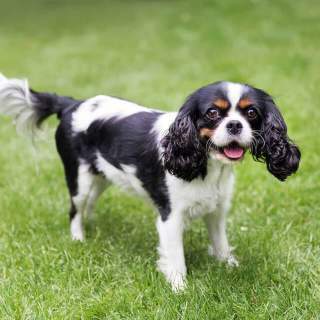 Due to the Cavalier's spaniel heritage they can have a tendency to chase non-canine pets (but this generally isn't an issue if the other pet stands up for itself). The breed is very friendly towards strangers, so they don't make very good guard dogs, although they will bark when someone is at the door. Much like the name suggests, the Cavalier King Charles Spaniel history has roots in that of the King Charles Spaniel. We all know the King Charles Spaniel was deeply admired by King Charles II of England and that they functioned as lap dogs for the wealthy and also as hunting dogs. After King Charles, the Duke of Marlborough kept many of the red and white King Charles Spaniels that were eventually named "Blenheim" after his estate. Through the years the breed experienced changes until, in 1926, Roswell Eldridge came from America to England and offered a prize for the the closest specimens of Blenheims to the original King Charles (which had a more pointed nose). After his death, a Cavalier breed club was founded in 1928 and with the goal of furthering what they now called the "Cavalier King Charles Spaniel" bred from those original winners of the prize. After WWII, however, only 6 registered dogs were left to serve as this new origin of Cavalier King Charles Spaniels. They did so spectacularly as in 1956 the first Cavs made their way to America and eventually surpassed the King Charles Spaniel in popularity. Although they did not gain AKC recognition until 1995, two breed clubs were founded-- The Cavalier King Charles Club USA, founded shortly after their arrival to America, and the American Cavalier King Charles Spaniel Club in 1994. 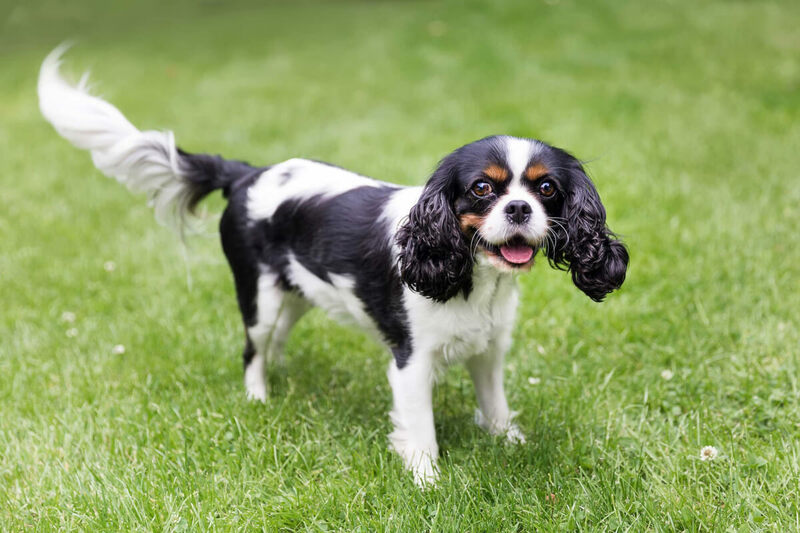 The Cav is a well balanced toy breed and it is essential this breed's looks portray its charming personality. Cavs are spirited in the field and gentle and affectionate at home. Every aspect of their composition gives a clue to a personality trait. First, let's talk about royal head and the adorably sweet face. 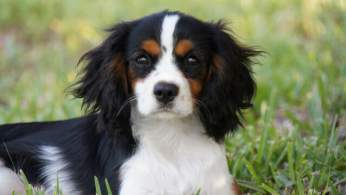 The muzzle is not exactly long, but not as short as their King Charles counterparts, and the ears are set high and hang long. 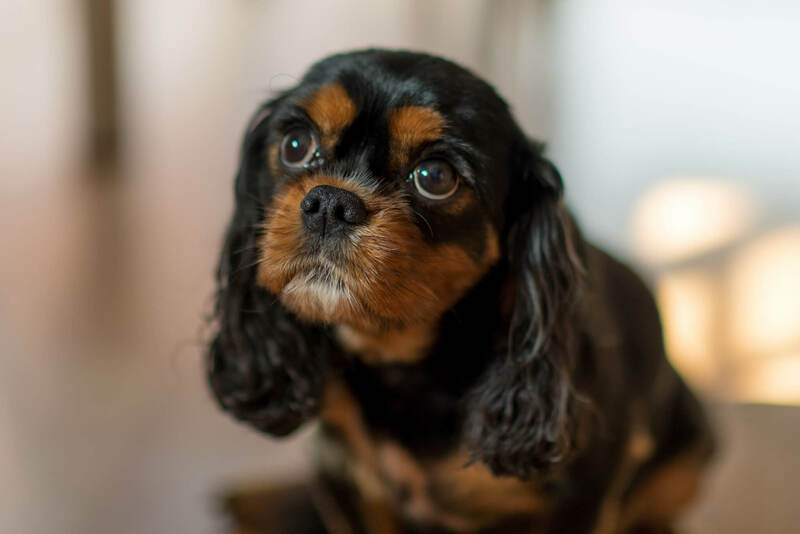 The Cavalier King Charles Spaniel eyes are the hallmark of the face-- they are large and round with dark brown coloring, and they almost appear to be shining. The breed is prone to eye issues so make sure to wipe away any discharge daily and visit the vet if it is abundant and colored. 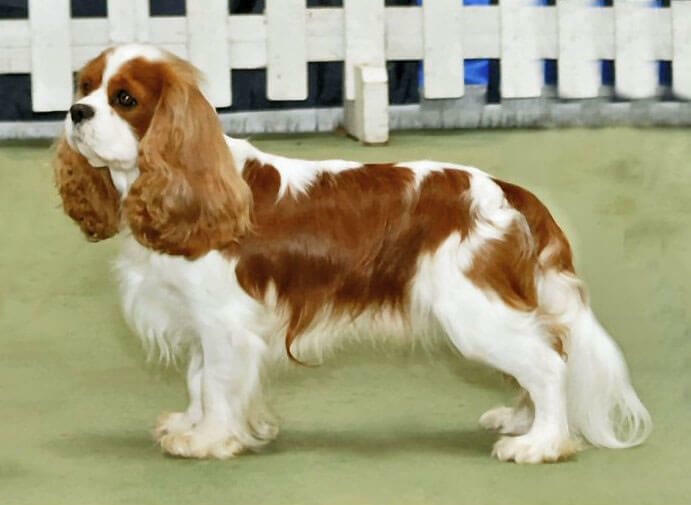 Next, the Cavalier King Charles Spaniel coat type is elegant and graceful and the breed standard recommends leaving it as is. The hair is medium length, silky and can have a light wave to it; feathering should be apparent on the ears, chest, legs, feet and tail. The Cavalier King Charles tail can be natural or docked but you can be certain that it will be in perpetual happy motion. There is a difference in acceptable Cavalier King Charles Spaniel colors whether you are abiding by the AKC standard or other standards so, if you are considering yours for show, you must consult your local (country) breed standard. 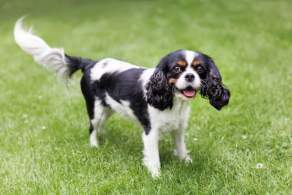 The main four are described below, however, note that the AKC does not recognize a Tricolor King Charles Spaniel but instead lists "Black and White" with the possibility of tan markings as an acceptable color; note that Black and White only is undesirable as per other standards. 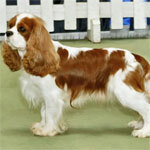 The Blenheim Cavalier King Charles is what many people think of as the characteristic look for the Cav. The coloring consists of chestnut colored makings on a white base. The Black and Tan Cavalier King Charles Spaniel are mostly vibrant black with deep tan markings over eyes, on cheeks, inside ears, on chest, legs and underneath the tail. 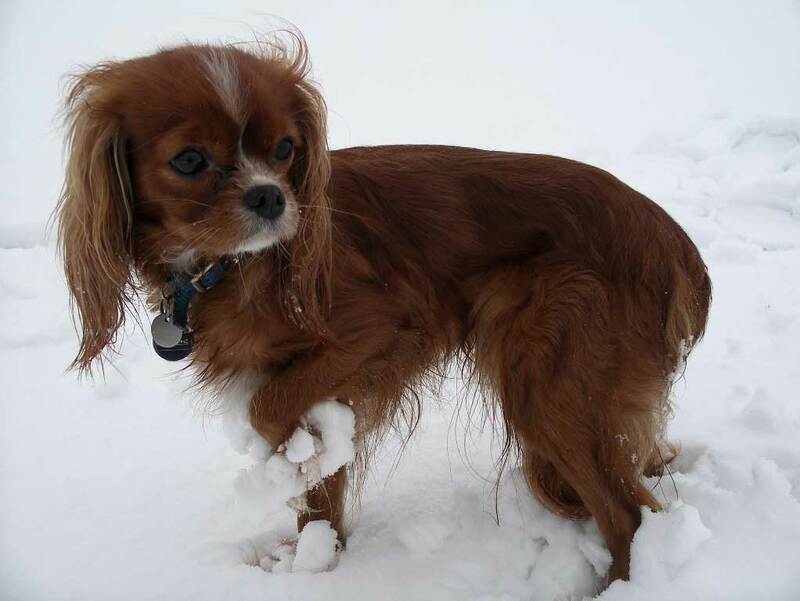 Ruby Cavalier King Charles Spaniels are a solid, intense red. Tricolors have vibrant black markings on a white background with rich tan markings above the eyes, on cheeks, in ears, on legs and underneath the tail. The fully grown Cavalier King Charles Spaniel's size is certainly small-- small enough for apartments, condos and other space limited dwellings. While they may be a gentle affectionate lapdog most of the time they will still need daily exercise (a few walks should do). 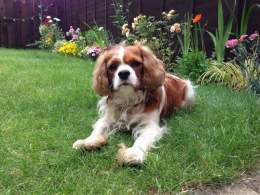 Most prospective owners want to know "How big do Cavalier King Charles Spaniels get?" 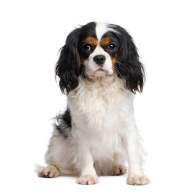 While the guidelines are not exacting for this breed, the average Cavalier King Charles Spaniel weight is 13-18 pounds, with a height of 12-13 inches at the shoulder. The breed standard states that weights can fluctuate a bit but an obviously overweight Cav will be penalized the same as an underweight runt. There is little variation among purebred Cavs other than coat color and the tendency of some coats to have a slight wave. Cavalier King Charles don't have short coats unless they are trimmed or clipped. It is important to note that Miniature, Toy and Teacup Cavalier King Charles Spaniels are not breeds-- they are not even officially recognized varieties. In fact, as breed standards, overly large and tiny Cavalier King Charles are to be disqualified from shows and competitions. Two issues arise from the breeding of extra small Cavs. First, this often encourages breeding of small, runty or unhealthy individuals and produces puppies with more health concerns. Second, some breeders cross a purebred Cav with a completely different, tiny breed to decrease the size. However, if you insist on paying the $2,000 or so for a Mini, Toy or Teacup, do your research to make sure the breeder has had heart, eye and hip certifications for the parents. 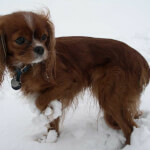 The Cavalier King Charles Spaniel temperament is spirited, affectionate, friendly and gentle. The personality is in complete harmony with their royal and graceful appearance. Adaptable is this dog's middle name; if you want to be a couch potato they'll be one with you and if you'd like to go on a long walk they'll love that too. This breed is friendly with everyone it meets-- including visitors, strangers, other dogs and even cats! This characteristic makes the Cavalier King Charles Spaniel a poor watch dog or guard dog. This is a prime choice for those with frequent visitors or that live in apartment buildings. The Cavalier King Charles is very playful and happy making them excellent for families with children of all sizes-- as long as they are careful not to hurt the tiny Cav. This breed is easy to train provided you have enough time for them. Although they are not as prone to separation anxiety as some other breeds, they still require daily time with their owner or family. Luckily these sociable Spaniels get along great with dogs and cats so having another pet is actually recommended! We do recommend a fenced yard and a leash for this fearlessly adventurous. The perpetually happy Cavalier King Charles is a child friendly choice, for sure. They are playful but not hyper if your child needs a playmate but can also be gentle and affectionate when it's time for a cuddle buddy. Basically, there is no question whether a Cavalier King Charles is good with kids-- the danger comes from kids that are rough and rambunctious potentially hurting your toy sized pet. We, therefore, recommend they only enter households with young kids if those children have been taught how to be careful and respectful with their beloved pets. This is a beyond excellent choice for households with other dogs and cats. Cavs are notorious for getting along with other dogs-- big or small-- and they even prefer the company. Likewise, Cavalier King Charles Spaniels and cats get along quite well; experts even recommend having another dog or cat in the home if you spend long hours away during the day for work or school. Due to their hunting backgrounds, small pets like birds, rodents and other small critters. Although some owners report training their Cavies to coexist with Guinea Pigs, hamsters and the like, we simply don't recommend it due to the stress it can cause to the small pet. On the subject of other critters, you will certainly need a fenced yard or a leash when taking your Cav outside as they are easily distracted and their adventurous spirits may lead them to chase anything tiny and moving. 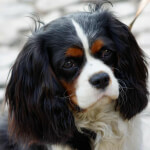 Below are pictures of the Cavalier King Charles Spaniel dog breed. When you consider owning a Cavalier King Charles let one word come to mind- adaptable. They can live in any type of household from apartment to mansion and make themselves at home. While they are not notorious for developing terrible separation anxiety it's not recommended to leave them along for days on end-- regular daily activities are fine. Experts recommend having another dog, or even a cat, to keep them company. Although this is definitely an indoor breed, a fenced yard is appreciated so their spirited curiosity doesn't allow them to roam too far. Other notable features include the adaptability of their activity level to yours. If you want to go out and walk they will be happy to accompany you, however, they will be just as content to curl up next to you on the couch. Also, the breed has no guard dog tendencies and is a great choice for households with frequent visitors or apartment complexes with many strange faces. 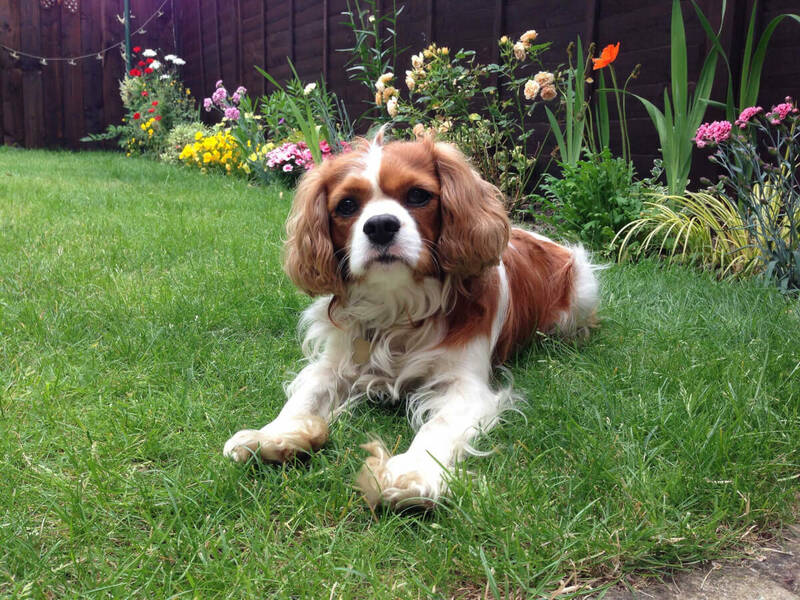 Now, the question you all have "Are King Charles Spaniels Hypoallergenic?". Sorry allergy sufferers, as wonderful as the breed is, they are not hypoallergenic. The medium length, silky coat sheds a normal amount but brushing a couples times per week can help reduce this shed and keep them free of tangles. 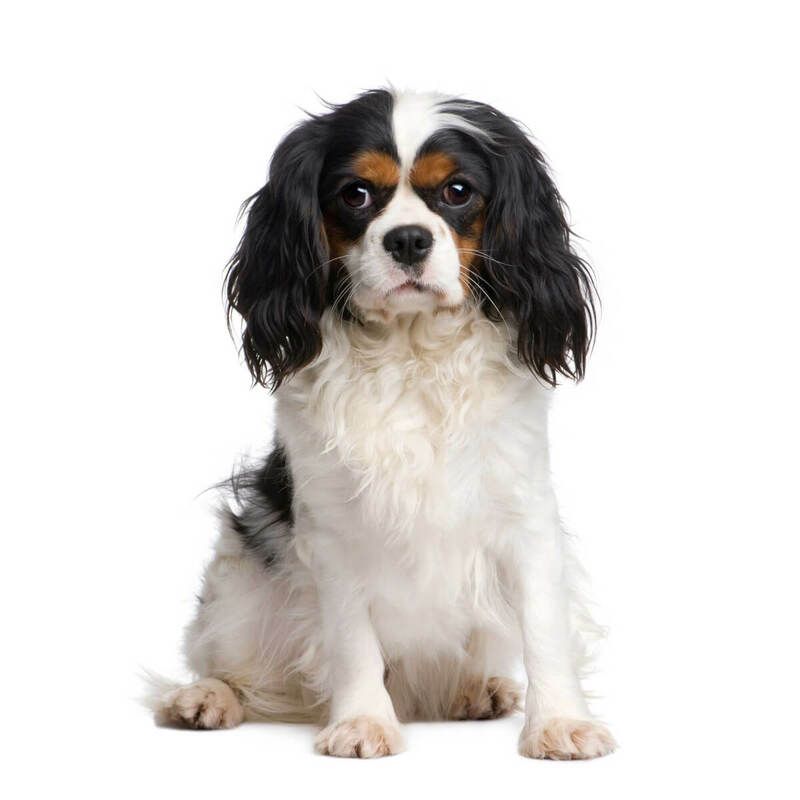 This breed is not one of those known to have many puppies that become an ugly Cavalier King Charles Spaniel. Still, there are some pups that might promise possible participation in any one of the growing number of ugly dog contests. Because of the Internet, ugly dog pics have become more than a fad. The trend has become an obsession for many people. As this Spaniel is not unlike the royals to which many of these dogs' bloodlines can be traced, there is an unusual amount of inbreeding. This can make any given Cavalier King Charles Spaniel have an outrageously sized forehead, or crazy teeth, or the hilarious hanging tongue — or all three! It's as sad as it is funny to some folks, but that's what sometimes happens. Syringomyelia is a nervous system disease where cerebrospinal fluid if forced through a narrow opening into the spine due to the skull not being large enough to accomodate the brain. Bear in mind your Cav may not have a single one of these issues, however, we recommend thorough research into your breeder of choice including proof of certifications for heart, eye and hip. Don't skip any scheduled vet visits for this breed, even if your Cavalier King Charles Spaniel puppy seems healthy-- your vet can help detect and even prevent certain conditions.